DR. 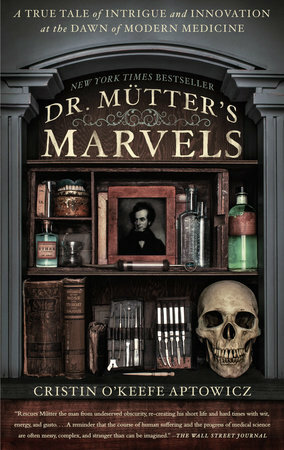 MUTTER'S MARVELS: A TRUE TALE OF INTRIGUE AND INNOVATION AT THE DAWN OF MODERN MEDICINE by Christin O'Keefe Aptowicz received a lot of great press when it was first released in hardcover last year. I never got around to reading it then, but fortunately I had a second chance when it was released in paperback. It's not a book that I would normally pick up; however, the Mutter Museum in Philadelphia has always intrigued me and I wanted to learn more about this fascinating man. DR. MUTTER'S MARVELS is the biography of Dr. Thomas Dent Mutter, an innovative doctor who changed the way surgeries are performed. He also was the founder of the Mutter Museum, a museum of medical oddities. He died at only 48 years old, but he made a huge difference in his life as a renowned teacher and surgeon. I guarantee there are quite a few things he discovered or worked on that I'm personally grateful for like anesthesia and better hygiene in hospitals. There is no doubt that Mutter was a great doctor and teacher, but he was also quite a character. He was over-the-top on many fronts including his style of clothes, his collection of medical oddities, and his feud with other doctors. Needless to say, he led an amazing life and Aptowicz's portrayal of it in this book is nothing short of fascinating. I thoroughly enjoyed DR. MUTTER'S MARVELS. It was a quick read for me and never dry which to be honest was a concern when I started reading the book. Dr. Mutter was an interesting man, both personally and professionally; and the time period in which is he lived was so exciting for the advancement of medicine. As difficult as portions of this book were for me to read (like the lack of anesthesia for major surgeries), it was fascinating to learn about medicine both before and after Dr. Mutter's contributions. One of the most interesting parts of this book was Mutter's relationship with his rivals, namely Dr. Charles D. Meigs. Dr. Meigs was very old school and didn't appreciate Mutter's innovative ideas. Dr. Meigs came across as almost a comical character, knowing what we know now about hygiene and medicine; and I found their rivalry to be very entertaining. The book ends with Dr. Mutter realizing that his death was imminent despite his young age. He worked until the very end, trying his best to teach medical students about his findings. In addition, he made sure that his medical collection had a home. Today, visitors can see Dr. Mutter's medical oddities in the Mutter Museum in Philadelphia. DR. MUTTER'S MARVELS was a fantastic biography about an interesting, and very important, many. Highly recommended to fans of biographies or readers interested in medicine. Thanks to Wunderkind PR for providing a review copy of this book. I can see where a lot of people would enjoy this one but I'm not sure it's for me. I can't wait to read this! It's on my list for this week.